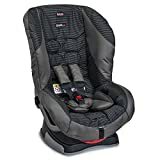 The Roundabout Convertible Infant Car Seat is a intelligent option for keeping your tiny 1 safe and sound as you head out there on lifetimes travels. SafeCell Impact Protection surrounds your own baby in safety components that operate together to protect well beyond the set up federal safety standards. And Complete Side Effect Protection shields your small one in a heavy protecting shell designed to absorb accident causes and protect from debris. To ensure the right match the Roundabout arrives along with a 2-Position Buckle to keep up with your growing baby and Plush Foam Padding offers premium comfort at every touch point. Installation is made simple with Easy-On / Easy-Off LATCH Connectors which lock in to place with an audible click and tend to be effortlessly released with the push associated with a button. The Roundabout is created to maintain you worry free and your baby safe, comfy and secure for the road ahead.